Feyisa Lilesa of Ethiopia made a protest gesture as he crossed the finish line in the marathon at the Olympics in Rio de Janeiro on Sunday. The Ethiopian marathoner who flashed an anti government gesture as he crossed the finish line in second place at the Rio Olympics will not go home. The runner, Feyisa Lilesa, will not fly back to Ethiopia on Tuesday with the rest of his team, his agent said, choosing instead to remain in Brazil with his immigration status unclear. 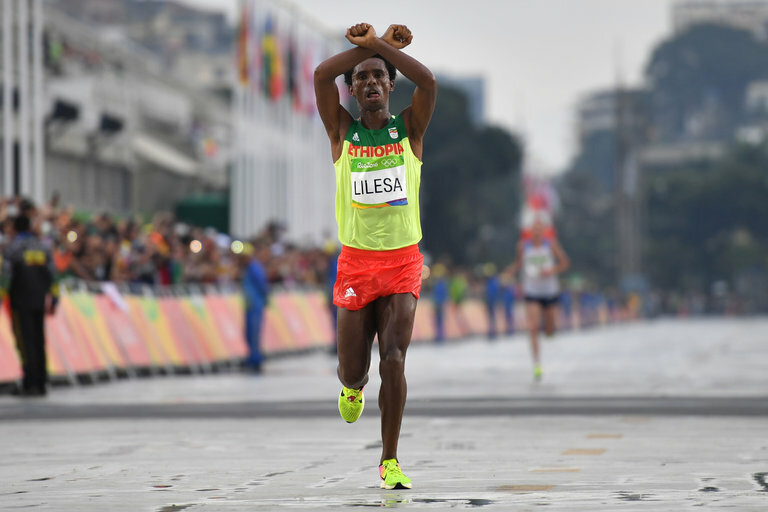 By raising his arms and crossing them in an X in front of his face as he crossed the finish line Sunday, Mr. Lilesa, 26, has crossed the Ethiopian government, one of the most repressive in Africa. His gesture, which he repeated during an award ceremony on Sunday after the race, was the most visible in a growing wave of protests in recent months against Ethiopia’s government. This unusual burst of protests has erupted across Ethiopia, especially in Oromia, the region from which Mr. Lilesa hails, and where the gesture of raised arms crossed in front of one’s face has become a sign of defiance. Tens of thousands of protesters have been jailed and hundreds have been killed, according to Human Rights Watch. Mr. Lilesa said in interviews after his race that he believed that if he were to return home, he, too, would be punished. The Ethiopian government has said he has nothing to worry about and that he would be treated like a hero upon his return. Some sports analysts have speculated that Mr. Lilesa, who finished the Olympic marathon in 2:09:54, and has one of the 50 fastest times in history, might chose to run for another country, such as Bahrain or Qatar. The Gulf states have wooed many other African-born athletes with promises of large pay days if they win international competitions. Mr. Rosa said that Mr. Lilesa, who won the Tokyo marathon this year and has a contract with Nike, did not make his protest in an effort to cash in. In an interview with journalists Sunday in Rio after his race, Mr. Lilesa saidhe did not discuss his protest beforehand with his agent, coaches, teammates or his family. His wife and two children remain in Ethiopia. If Mr. Lilesa wants to apply for asylum in the United States, it would be difficult to do that while in Brazil. He might first have to get asylum in Brazil and then apply to the American authorities for so-called humanitarian parole. Under that program, which is used sparingly, often for people in danger, Mr. Lilesa would be allowed to travel to the United States and stay temporarily. Once on American soil, he could apply for political asylum. Mr. Lilesa has became a sensation on social media. As of Tuesday night, nearly $100,000 had been raised for him via a crowdsourcing website. “We assure you all the money collected will go to support this Oromo/Ethiopian hero,” the site said.